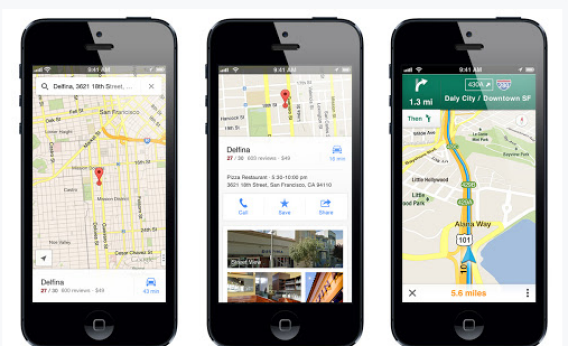 Google Maps for iPhone: Apple and Google are reunited, and it feels so good. Our quarrel was a way of learnin’ so much. I was a fool to ever leave your side / Me minus you is such a lonely ride. The breakup we had has made me lonesome and sad / I realize I love you ‘cause my maps are bad, hey, hey. Remember when things got so ugly that Steve Jobs threatened to spend “last dying breath” and “every penny of Apple’s $40 billion in the bank” to wage a “thermonuclear war” on Google in retribution for building an iPhone rival? Well, people say such things in the heat of the moment. But today it seems the quarreling companies have reached an understanding: There’s one perfect fit, and sugar, the iPhone and Google Maps is it. A former Apple engineer stirred up a lot of debate in the tech world last month with a blog post making the case that “Google is getting better at design faster than Apple is getting better at Web services.” It may be true that, for instance, Google’s Android system does a better iOS impression than Apple Maps does a Google Maps impression. But the fact remains that neither company today can beat the other at its own game. Apple makes the best smartphones. Google makes the best maps. Apple can’t afford to put out mobile devices with inferior services, and Google can’t afford to have its services available only on inferior mobile devices. The relationship between the two may still be love-hate, but when they set aside their differences, everyone wins.